There is a sweeping moment of dread that occurs when you close your house door behind you only to realize that you've left your keys inside. If you have a hidden spare key under a mat, then you're golden. Of course, if you used that key the last time you were accidently locked out and didn't replace it, then you're back to feeling dread. Your stress levels can increase if you're already running late for an appointment. At least your home is locked up! 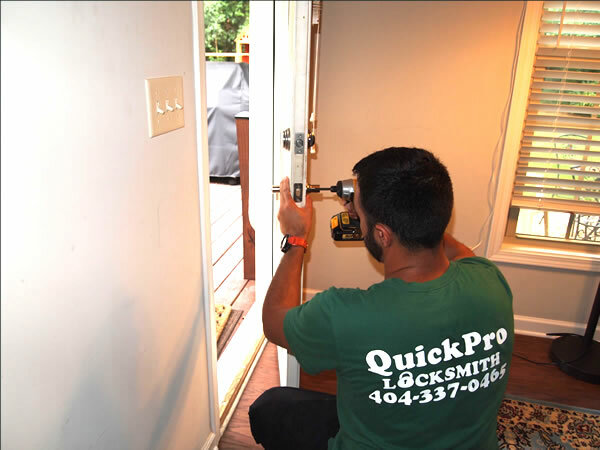 QuickPro Locksmith offers reliable 24 HOURS emergency house / home lockout, residendial lock change, home lock change, house lock change in Atlanta, Brookhaven, Decatur, Stone Mountain, Norcross, Tucker, Dunwoody, Smyrna, Chamblee, GA and all surrounding areas. If you can spare a few moments, then QuickPro Locksmith can ride to your rescue. We're a full service locksmith covering all of Atlanta. Our many crews are situated through the area. That means no matter where you are you won't be far from a QuickPro Locksmith. Once you place your emergency call into the QuickPro Locksmith service center, one of our train locksmith technicians will be dispatched to your home. If you need to get to that appointment, then you can schedule your QuickPro appointment for when you return home. The locksmith will be waiting for you! Upon arrival, the QuickPro Locksmith will survey the situation. If there is a way for them to gain access into your home without popping the lock, they will attempt that option first. Otherwise, they might need to remove your existing lock in order to get inside. Every QuickPro Locksmith will arrive in a service van that is fully equipped with all the tools needed for any type of lockout out situation. They carry a complete line of replacement lock kits. From start to finish, the QuickPro Locksmith can get you safely back in your home is less time than it would take you to go out to lunch. Outside of those emergency situations, you might need to call upon the QuickPro Locksmith team to help enhance your home's security or replace your locks. If you had a roommate or tenant move out, then you should replace all the locks they had access to especially if they ended up taking the key with them. You might trust that person, but can you say the same for everyone your former roommate will come into contact with? You'll have peace of mind knowing that you control the locks on your doors. If you're happy with your current lock situation but would rather have all the locks working on a single master key, then QuickPro Locksmith will have you covered. Our locksmiths can rekey all of your existing locks so that you only need one key for entry. That will certainly lighten the load on your current keychain. While the QuickPro Locksmith is swapping out your locks, they can also conduct an onsite review of the rest of your security issues. There might be some vulnerable areas such as a yard gate or garage door that could benefit from a stronger lock. These measures can include the installation of what is referred to as high security locks. These would be the type of keypad locks that remove the actual key from the situation. Instead, you'll enter a code to get inside your home. Incidents of identity theft are on the rise. The number one way that thieves gain access to your personal information is by stealing your mail. If you have an open mailbox setup, then you should consider some type of mailbox lock. Once again, the QuickPro Locksmiths can ride to your rescue and provide you with a wide array of these types of locks. All of the locksmiths working at QuickPro have been certified and licensed to operate in the Atlanta area. These highly trained professionals stay current with the changing trends in locks and security system. That means they'll be able to handle whatever type of lockout or lock change situation you throw at them. Call today to set up an appointment and to get a free quote. Make sure you program our number into your cell phone. It won't do you any good if it's locked inside your home!